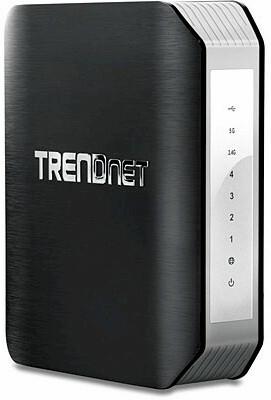 TRENDnet hasn't had much success at producing a top-performing AC1750 router. It has tried twice with its TEW-812DRU and TEW-812DRU V2, with both ending up near the bottom of our AC1750 router ranking. But the industry has moved on to having AC1900 as the top-of-line AC option, so TRENDnet has followed suit with the TEW-818DRU I'm reviewing today. The callout diagram below shows the 818DRU sports both USB 2.0 and USB 3.0, just like NETGEAR's R7000 Nighthawk, ASUS' RT-AC68U and Linksys' EA6900. Otherwise, the ports, switches and indicators are the same as found on the AC1750 class TEW-812DRU V2. The 818DRU sticks close to the AC1900 router design playbook with Broadcom's BCM4708A at its heart, backed by 128 MB of RAM and 16 MB of flash. Note that TRENDnet has opted for three internal dual-band antennas, while all of its competition uses external, upgradeable dual-band dipoles. Table 1 shows the key components for both the TRENDnet and its AC1900 competition.